Groundwater losses during historic drought equal one and a half times the volume of a full Lake Mead. 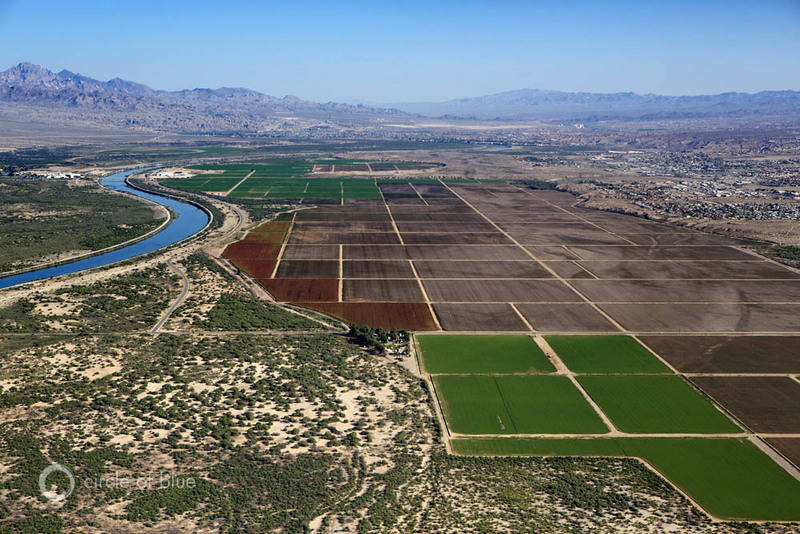 The Colorado River flows past irrigated fields in Arizona. During a dry decade, most of the water losses in the seven-state basin come from groundwater, according to new research. Click image to enlarge. But the receding shorelines at the Basin’s major reservoirs — including Lake Mead, which fell to a record-low level this month, and Lake Powell, the second largest reservoir on the Colorado, 290 kilometers (180 miles) upstream from Mead — are an insignificant hydrological change compared to the monumental disruption taking place underground. Satellite data show that in the last nine years, as a powerful drought held fast and river flows plummeted, the majority of the freshwater losses in the Basin — nearly 80 percent — came from water pumped out of aquifers. Launched in 2002, GRACE is a pair of satellites that translate fluctuations in the Earth’s gravitational pull into changes in total water storage. Separate data sets are used to pull apart the contributions from snowpack, soil moisture, surface water, and groundwater. 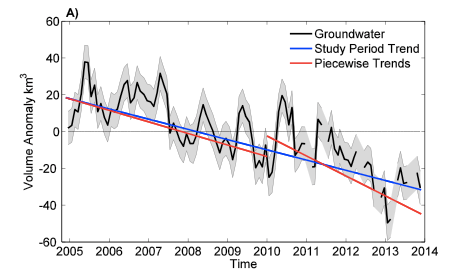 GRACE data has been used to assess groundwater depletion in California and the Middle East, as well as flood potential in the Missouri River Basin. The black line shows monthly trends in groundwater storage in the Colorado River Basin. The blue line is the average trend for the study’s December 2004 to November 2013 time frame. The red lines show the trends before and after February 2010, when the rate of groundwater depletion increased. Click image to enlarge. Chuck Cullom, Colorado River manager at the Central Arizona Project, which delivers more than half of Arizona’s Colorado River allocation, said the study was helpful. You want data on groundwater aquifers? Check out all the research that has been done on the San Pedro River in Arizona.